SAVE £59 ON YOUR TICKETS THIS SEASON. Create your FREE Rewards4Rugby League account to start saving for your next matchday. Spend your points on all the top rugby league events, plus the latest merchandise. As a Rewards4Rugby League member you’ll collect points on all sports bets with our betting partners. 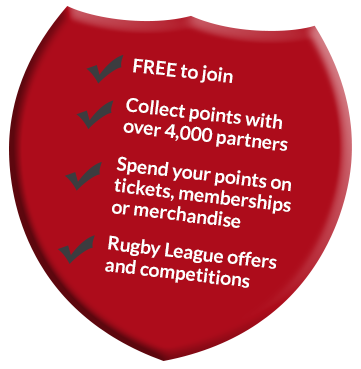 If you don’t have an account with any of our partners, sign up and deposit today to collect 2,000 Rewards4Rugby League points! Simply redeem your points for a voucher from our rugby league partners, including lovell rugby, Hull FC, St Helens R.F.C the Rugby Football League (RFL) and Super League Europe (SLE). Congratulations, you have won 50,000 points! Please contact our Customer Services Team on 0345 605 5220 and we will award the points to you. You have now collected your points! Please log in to your account to view your points.